Plast Aesthet Res 2018;5:36.10.20517/2347-9264.2018.50© The Author(s) 2018. 1Department of Plastic and Reconstructive Surgery, St. Josef Hospital, Vienna 1130, Austria. 2Department of Plastic and Aesthetic Surgery, Reconstructive & Hand Surgery, St. Markus Hospital, Frankfurt 60431, Germany. 3Department of Hand, Plastic and Reconstructive Surgery, St. Gallen Cantonal Hospital, St. Gallen 9000, Switzerland. Aim: The use of negative pressure wound therapy (NPWT) is well established in the treatment of chronic wounds. NPWT with instillation (NPWTi) combines traditional NPWT with the application of a topical irrigation solution (in this case octenidine based octenilin® wound irrigation solution) within the wound bed. The purpose of the study was to investigate the impact of NPWTi on pressure ulcers (PUs). Methods: In total 13 patients with PUs in different locations were treated with negative pressure therapy combined with ocitenidine based instillation fluid after first surgical debridement. 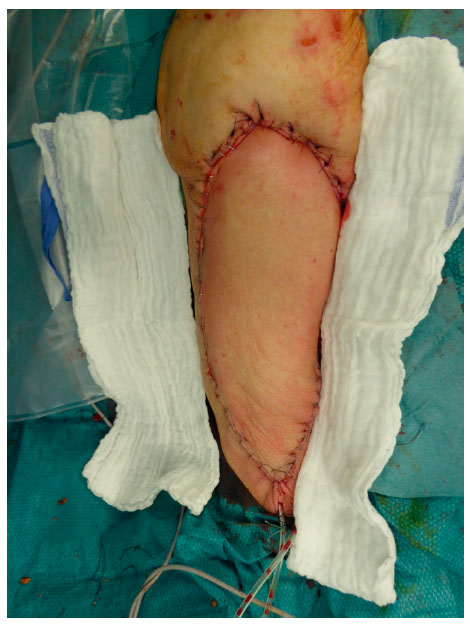 After 6 days the dressing was removed and wound closure using different local flaps was performed. Results: Normal wound healing without irritation was found 30 days post-debridement and after 90 days the wounds showed complete healing. No adverse incidents occurred and no toxic tissue reactions were documented. During the follow up period, there was no recurrence of the PU in any of the treated patients. Conclusion: It is generally recognised that for chronic wounds to heal, optimum wound bed preparation is of paramount importance. This helps prepare for secondary healing, skin grafting or coverage with flaps. Tests were performed in vitro simulating real clinical conditions using PU vacuum exudates. These tests quantified the antiseptic efficacy of octenilin® wound irrigation solution in the eradication of microorganisms. Further research is needed to establish the role of NPWTi with octenilin® in the management of category 4 PUs, but these initial results on 13 patients lead in the direction of developing an enhanced protocol for the treatment of chronic wounds. Wound healing is a highly complex process which is critical in maintaining the barrier function of the skin. Chronic, non-healing wounds subject a patient to significant discomfort and distress while also using a considerable amount of costly healthcare resources. A pressure ulcer (PU) is a localised area of tissue destruction which occurs when soft tissue is compressed over bony prominences for a prolonged length of time. The tissue destruction occurs when the compressed tissue is deprived of oxygen. PUs are estimated to affect 18% of patients in hospitals and care facilities in Europe. This prevalence is projected to rise due to an increasingly aging population. Patients at particular risk of developing PUs include older patients and those with paraplegia. Around 21% of paraplegic patients develop a PU, usually caused by continual skin pressure inhibiting the adequate circulation of blood to the skin and underlying tissue. This frequently leads to chronic complications meaning that on average a patient with paraplegia will be hospitalised every three years as a direct result of a PU. The European Pressure Ulcer Advisory Panel (EPUAP) has categorised PUs into four categories based on severity of the lesions. These are defined below and provide a useful starting point for the management of category 4 PUs. Category 1: intact skin with non-blanchable redness of a localized area usually over a bony prominence. The area may be painful, firm, soft, warmer or cooler as compared to adjacent tissue. Category 2: partial thickness loss of dermis presenting as a shallow open ulcer with a red pink wound bed, without slough. May also present as an intact or open/ruptured serum filled blister. Category 3: full thickness tissue loss. Subcutaneous fat may be visible but bone, tendon or muscle are not exposed. May include undermining and tunnelling. The depth of a category/stage III PU varies by anatomical location. Category 4: full thickness tissue loss with exposed bone, tendon or muscle. Slough or eschar may be present on some parts of the wound bed. Often includes undermining and tunneling. There are many forms of management depending on the category and severity of the PU. A conservative, non-surgical approach may be appropriate for categories 1 and 2. However, categories 3 and 4 PUs usually require surgical management. Optimum pre- and post-operative care plays a key role in avoiding recurrences. Surgery may be undertaken to perform skin grafts and flap coverage, which can provide efficient and rapid methods to close wounds with good functional and aesthetic results. There are various wound closure techniques available to the reconstructive surgeon and the reconstructive ladder is a spectrum of closure options from simple primary wound closure to more sophisticated flap reconstructive techniques. Where possible closure should be achieved by the simplest effective technique. In terms of increasing complexity, the ladder goes from healing by secondary intention, healing by primary intention, delayed primary closure, split thickness skin grafts, full thickness skin grafts, tissue expansion, random flaps, axial flaps and free flaps. Unlike skin grafts, flaps have their own blood supply and good results have been demonstrated in the treatment of complex wounds using this technique. When select a flap for the reconstruction of a pressure wound, several factors must be considered including the site of the pressure sore, the flap design and the location of the flap relative to the site of coverage. Before undertaking any wound closure surgical procedure, the wound bed must be clean and clear of infection. Risk factors such as malnutrition, shear force, missing sensibility, moist wound situation and incontinence need to be managed prior to surgery. Any source of infection must be cleared and if the patient requires it, a nutritional support programme should be undertaken. Negative pressure wound therapy (NPWT) has played an increasingly significant role in wound management and a number of uses for this method have been reported, ranging from acute and chronic wounds, to closure of open sternal and abdominal wounds, and assistance with skin grafts. In terms of wound bed preparation the efficacy of NPWT has been well documented. NPWT is a physically acting treatment which is designed to create a moist, sterile wound environment under sub-atmospheric pressure. This helps promote wound granulation, epithelisation and contraction of the wound[1,8]. Due to a number of factors, including less frequent dressing changes, reduced nursing time, improved healing rates, and decreased lengths of hospital stay, cost savings have been reported when using NPWT[1,9,10]. In terms of serious adverse events during NPWT, these have been rarely reported. In comparison to traditional wet-to-moist dressings, NPWT has shown benefits in the reduction of wound volume. To summarise, NPWT helps increase wound blood flow, increases granulation tissue formation and stimulates wound healing pathways through shear stress mechanisms. A modification of NPWT added instillation of topical wound irrigation solutions to traditional NPWT. This combined therapy, termed NPWT with instillation (NPWTi), has been shown to be effective in the treatment of a variety of complex wounds and reduces bioburden and biofilms present in wounds, which helps the healing process. Multiple microorganisms, in particular Staphylococcus aureus and Streptococcus spp. are frequently found to colonise PUs. Morbidity and mortality are significantly increased if an infection is caused by antibiotic resistant bacteria such as methicillin-resistant Staphylococcus aureus (MRSA) or extended-spectrum β-lactamase (ESBL)[15-19]. Octenidine is a broad spectrum antiseptic agent which has been demonstrated to be effective in eradicating many microbes, typically found in wounds[20,21]. Octenidine has the ability to reduce or prevent the microorganism-induced formation of biofilms in chronic wounds, which is of particular importance as these microorganisms can promote the incidence and the persistence of infections. An additional benefit is that octenidine based rinsing solutions have a rapid onset of action and have good tissue tolerability. When NPWT is combined with instillation, the negative pressure is not maintained during the instillation of the rinsing solution and at this time, the system is prone to leakage. Therefore the instillation needs to be kept to a minimum, using a fast acting wound rinsing solution. The aim of this study was firstly to assess octenidine based wound irrigation solution in ex vivo exudate samples and to compare octenidine with other rinsing solutions. Furthermore, we examined the impact of using NPWTi together with octenilin® wound irrigation solution on 13 patients with category 4 PUs (sacral, gluteal/ischial or trochanteric, respectively). Whereas the first 3 patients were assessed in 2014, another 10 patients were treated between 2015 and 2017 in a multicentric approach. To simulate realistic wound conditions, wound exudates from patients with leg ulcers, treated with conventional NPWT, were obtained. This occurred when the foam dressings in the wounds were replaced. At this point they were transferred into sterile containers, then soaked with 5 mL of a protease inhibitor solution (Complete Protease Inhibitor Cocktail Tablets, Roche, Germany). To collect wound exudates, the dressings were cut into appropriate pieces using sterile scissors and then squeezed through a sterile press. The wound exudates were collected and captured in 50 mL centrifuge tubes and stored at -20 °C until processing continued or at 6 °C when processed on the same day as the exudates were collected. Comparative data was obtained by also testing Serasept® (containing polyhexamethylene biguanide 0.04%; Serag-Wiessner GmbH & Co. KG, Germany) and Prontosan® (containing polyhexamethylene biguanide 0.1%; Braun Melsungen AG, Germany) rinsing solutions. A negative control was provided using saline solution. Quantitative suspension tests were performed according to the dilution-neutralisation method described in DIN prEN 13727:2009. The tests conformed to the conditions for low organic load (0.3 g/L of bovine serum albumin) and for high organic load (0.3 g/L of bovine serum albumin and 3.0 mol/L of ovine erythrocytes). This method was fine tuned depending on the volume of the extracted wound exudates. One part of load solution was mixed with one part of bacterial suspension. 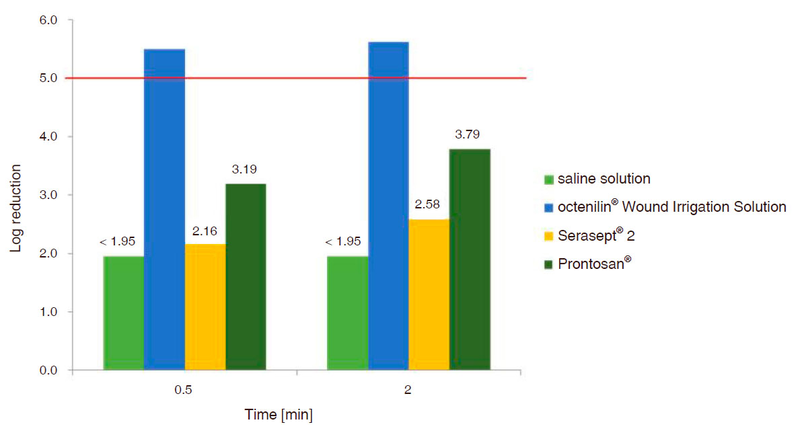 After 2 min, 8 parts of the negative control (0.9% saline solution) or one of the following rinsing solutions - octenilin® Wound Irrigation Solution (containing octenidine dihydrochloride 0.05%), Serasept® 2 or Prontosan® were added and the test mixture was completely blended using a vortex mixer. At the predetermined exposure times - 0.5 and 2 min - the solution was stirred again and 1 part was added to 9 parts of neutralisation solution. After the neutralisation time was complete, a serial dilution up to 10-2 was prepared and the appropriate amount of solution was placed on agar plates. The wound exudates were diluted in a sterile dilution series with tryptone sodium chloride (Tryptone-NaCl) and plated on Casein Soy Peptone Agar (CSA) according to the dilution levels. All visible colony forming units (CFU) were counted, regardless of their species. Additionally, the exudate samples were spiked with the test organism Staphylococcus aureus ATCC 33592 (MRSA strain) to further increase the microbiological load. Storage and cultivation of the test organism was conducted in accordance with legal regulations (prDIN EN 12353:2011). According to the requirements given in DIN prEN 13727:2009, antiseptic agents must reduce the live cell count by five orders of magnitude. This reduction is considered to be a sufficient antibacterial effect. Initially 3 patients with category 4 gluteal PUs were treated with NPWTi in combination with octenilin® wound irrigation solution for wound bed preparation. Gluteal/ischial PUs are at higher risk of infection. In the following period 10 additional patients with various PU localizations were admitted to following hospitals: St. Josef Hospital Vienna, Austria (2 sacral, 1 ischial/gluteal PU), St. Markus Hospital Frankfurt, Germany (2 sacral, 1 ischial/gluteal PU), Innsbruck Medical University, Austria (1 sacral, 1 trochanteric PU), Hospital St. Gallen, Switzerland (1 sacral, 1 trochanteric PU). All patients underwent a surgical debridement of necrotic tissue as the first stage of treatment. This was undertaken to remove fluid, exudates and infectious material. NPWT (V.A.C.ultaTM) was applied to the wound. A foam dressing (V.A.C. Granu-FoamTM, Kinetic Concepts Inc., San Antonio, TX, USA) was cut into a shape which perfectly fitted the wound cavity. A transparent film was then used to seal the wound and a track pad connected to an adjustable vacuum pump, was applied. The treatment continued for 6 days, after which the wound bed was fully prepared for surgery and free from visible signs of infection. Following successful preparation with NPWT and octenilin instillation, wound closure was indicated in all 13 patients. According to the reconstructive ladder, wounds may be covered in ascending order of complexity. Flaps in particular - which, unlike skin grafts, have their own blood supply - have shown good results in treatment of complex defects. A major challenge in flap coverage is adequate flap selection which involves considering several factors including the site of the pressure sore, flap design and the location of the flap relative to the site of coverage. For covering large pressure sores in the gluteal/ischial region the posterior thigh flap is often used due to its large reservoir of skin, fascia and muscle. Local flap coverage was conducted in the first 3 patients, which all suffered from gluteal PU, by using the posterior thigh flap. 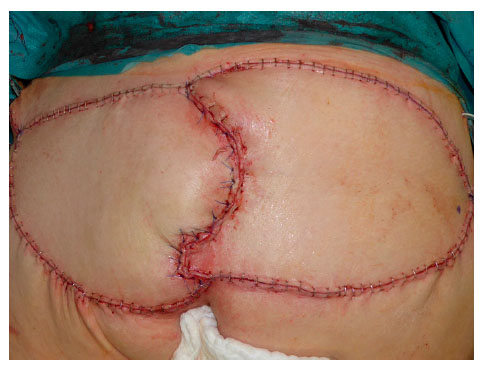 For the additional 10 patients following local flaps were used: 3 fasciocutaneous VY-flaps [Figures 1 and 2] to cover 2 sacral [Figures 3 and 4] and 1 ischial PUs; 3 fasciocutaneous rotational flaps were chosen to cover sacral PUs; 2 myocutaneous posterior thigh flaps covered ischial/gluteal lesions [Figures 5 and 6] and 2 tensor fascia lata mycutaneous flaps were considered relating to trochanteric PUs. During the 6 days of NPWT and instillation, visual signs of local inflammation were monitored at each dressing change. It was observed that inflammation decreased over the course of NPWTi treatment. Granulation tissue formation was observed in all thirteen cases. Six days post-debridement, the wounds were clean with no visual signs of inflammation. The V.A.C. system was removed and wounds were rinsed with the antiseptic agent octenisept®. The combination of NPWT and octenidine in all 13 patients showed that octenidine is well tolerated and no toxic tissue reactions were reported. These results are consistent with the biocompatibility index (BI) evaluated for octenidine, in which the antimicrobial activity and the cellular cytotoxicity of antiseptic agents are assessed. Octenidine demonstrated excellent results on this index, reflected by a BI greater than 1 and therefore superior to a number of antiseptic agents. Following NPWTi treatment, the wound beds of all patients were clean and clear of infection. A suction drain was positioned under the flap to prevent postoperative fluid accumulation. Patients were cared for on air-fluidised beds to reduce pressure on the wound site. No signs of inflammation or wound dehiscence around the wound site were observed on day 10 postoperatively. Every day, wound cleansing was conducted using octenisept®. Three weeks after surgery sutures were removed. Thirty days post-debridement, normal wound healing without any signs of irritation or infection was observed. In 6 of 13 patients superficial wound healing disorders were reported, maximum until the 25th day after surgery. After 90 days the wounds showed complete healing. No further follow-up visits were required. Coagulase negative staphylococci, Pseudomonas spp., Proteus mirabilis, Acinetobacter spp. and E. coli were found to be the main flora identified on the wound exudates. There were four independent experiments for each rinsing solution. The results examined below represent the mean value for each one. A sufficient bactericidal effect was achieved both after 0.5 and 2 min of exposure to octenilin® wound irrigation solution on the spiked MRSA strain and the accompanying flora of the vacuum exudates. Although, it also induced a lg RF > 5 after 0.5 min contact time the accompanying flora was not fully eradicated in two exudate samples. However, the polyhexanide (PHMB) based wound rinsing solutions (PHMB 0.04% or 0.1%) were not effective in bacteria eradication [Figure 7]. Saline solution which was used as the negative control induced a lg RF < 1.95 at all time points. The principal aim of studying the 13 patients was to examine optimal conditions for wound bed preparation following surgical debridement. All studied patients were admitted with category 4 PUs and their wounds were colonised with either Streptococcus or Staphylococcus species prior to NPWTi using octenilin® wound irrigation solution. After debridement and a 6-day treatment period, the wounds were free from observed infection and granulation tissue was seen. Microbial load reduction was demonstrated in previously performed in vitro tests simulating clinical conditions, when wound exudates were loaded with MRSA. After 30-s exposure to octenilin® wound irrigation solution, a sufficient bactericidal effect was demonstrated. This testing formed the basis for the shortened instillation phase in NPWTi. The novel concept of combining NPWT with an antiseptic wound rinsing solution was seen to be beneficial in wound bed preparation, prior to flap surgery in the patients studied. All studied patients demonstrated complete healing 90 days after initial wound debridement. Of particular interest is the short instillation phase of just three minutes, when NPWT is combined with octenilin® wound irrigation solution instillation. During the instillation of the rinsing solution the negative pressure is not maintained and the system is prone to leakage, so this phase should be as short as possible. Conventional NPWT or the use of antiseptic soaked dressings are typically the treatments of choice for preparing the wound bed prior to grafting or flap coverage. In the novel approach described in this paper, both methods were combined successfully. A short treatment period was required using this approach, meaning that less than a week was needed for the combined NPWT/instillation phase. After only 6 days, there were no signs of wound infection and granulation was taking place in the studied patients. Given that chronic PUs can be difficult to treat and are often accompanied by bacterial infections, future studies examining NPWT combined with instillation should be considered. It would be particularly interesting to undertake a comparative study examining different wound rinsing solutions. This could be useful in providing data on which to base optimum care. Although NPWT is recognised as a useful treatment option for chronic wound management, it is possible that in combination with octenilin® wound irrigation solution instillation, NPWT may also be considered as part of the management of other chronic complex wounds. In the “Negative-pressure wound therapy with instillation: international consensus guidelines” an instillation time of 10-20 min using non-octenidine based rinsing solutions is regarded as appropriate. At the time of publication, octenidine based solutions were not available in the US. Perhaps it is now time to revisit these guidelines and give consideration to the much shorter instillation times observed in this study. As seen in this study, the instillation of an antiseptic rinsing solution with proven in vitro antibacterial efficacy provides an interesting approach for effective wound healing. This method was found to be successful in all 13 patients studied, in terms of preparing the wound bed prior to surgical intervention. After 2 min of exposure to octenilin® wound irrigation solution a sufficient bactericidal effect to eradicate MRSA and the accompanying flora of the wound exudates was shown during in vitro testing. In comparison the microbial load was not sufficiently reduced within the required contact time when the same wound exudates were exposed to different PHMB based rinsing solutions. Therefore it is worth considering that the short duration of antiseptic wound rinsing during NPWT, may be insufficient if PHMB rinsing solutions are used. This requires further investigation. Our findings are similar to those in a study conducted by Ludolph et al., where a total of 111 patients were treated with negative pressure therapy combined with instillation. They also found a positive effect concerning reduction of the bacterial load in contaminated wounds. It is generally acknowledged that the high treatment costs of managing chronic wounds place a considerable burden on healthcare resources. Given the successful wound healing and absence of observed infection in all 13 patients, the combination of NPWT with octenidine wound rinsing could indicate a novel protocol for chronic wound management. In conclusion, in this small study, 13 patients with category 4 PUs were managed with NPWT and instillation of octenilin® wound irrigation solution, following surgical debridement. The results demonstrated that this combination was effective in preparing the wound bed before the wound was surgically closed. No signs of infection were observed, good tissue compatibility with octenidine-based solutions was noted and complete healing was seen after 90 days. None of the observed patients required subsequent follow up appointments. A broad-spectrum antimicrobial efficacy was demonstrated in vitro for octenilin® wound irrigation solution, with only a short contact time required and with good tissue compatibility. Further investigations are now required to examine in more depth the possibilities offered by NPWTi and octenilin® wound irrigation solution instillation in the management of PUs. Patient records are available in respective hospital data bases. The study involved standard treatment regimens. All procedures were performed with full informed consent of patients. The study was performed in accordance with the Declaration of Helsinki. 1. Othman D. Negative pressure wound therapy literature review of efficacy, cost effectiveness, and impact on patient's quality of life in chronic wound management and its implementation in the United Kingdom. Plast Surg Int 2012; doi: 10.1155/2012/374398. 2. Vanderwee K, Clark M, Dealey C, Gunningberg L, Defloor T. Pressure ulcer prevalence in Europe: a pilot study. J Eval Clin Pract 2007;13:227-35. 3. Giuglea C, Marinescu S, Florescu IP, Jecan C. Pressure sores -- a constant problem for plegic patients and a permanent challenge for plastic surgery. J Med Life 2010;3:149-53. 4. Romanelli M, Clark M, Cherry G, Colin D, Defloor T. Science and practice of pressure ulcer management. London: Springer; 2006. 5. Kuipers T, Stark GB, Spilker G. Costs and long-term results of plastic surgery tretment of decubitus ulcers in paraplegic patients. Handchir Mikrochir Plast Chir 1995;27:161-5. 6. European Pressure Ulcer Advisory Panel and National Pressure Ulcer Advisory Panel (EPUAP). Treatment of pressure ulcers: quick reference guide. Washington DC: National Pressure Ulcer Advisory Panel; 2009. 7. Ahluwalia R, Martin D, Mahoney JL. The operative treatment of pressure wounds: a 10-year experience in flap selection. Int Wound J 2009;6:355-8. 8. Broder K, Li A. The Use of V.A.C. Instill in the wounded pediatric population. Wounds 2010;22:E13-6. 9. Pennsylvania Patient Safety Authority. Improving the safety of negative-pressure wound therapy. Available from: http://patientsafety.pa.gov/ADVISORIES/documents/201103_18.pdf. [Last accessed on 23 Aug 2018]. 10. Dowsett C, Davis L, Henderson V, Searle R. The economic benefits of negative pressure wound therapy in community-based wound care in the NHS. Int Wound J 2012;9:544-52. 11. Vikatmaa P, Juutilainen V, Kuukasjärvi P, Malmivaara A. Negative pressure wound therapy: a systematic review on effectiveness and safety. Eur J Vasc Endovasc Surg 2008;36:438-48. 12. Desai KK, Hahn E, Pilikkotill B, Lee E. Negative pressure wound therapy: an algorithm. Clin Plast Surg 2012;39:311-24. 13. Wolvos TA. Negative pressure wound therapy with instillation: the current state of the art. Surg Technol Int 2014;24:53-62. 14. O'Meara S, Cullum N, Majid M, Sheldon T. Systematic reviews of wound care management: (3) antimicrobial agents for chronic wounds; (4) diabetic foot ulceration. Health Technol Assess 2000;4:1-237. 15. ECDC. The bacterial challenge: time to react. Available from: http://www.ecdc.europa.eu/en/publications/Publications/0909_TER_The_Bacterial_Challenge_Time_to_React.pdf. [Last accessed on 16 Sep 2018]. 16. Kim T, Oh PI, Simor AE. The economic impact of methicillin-resistant staphylococcus aureus in Canadian hospitals. Infect Control Hosp Epidemiol 2001;22:99-104. 17. Macedo-Viñas M, De Angelis G, Rohner P, Safran E, Stewardson A, Fankhauser C, Schrenzel J, Pittet D, Harbarth S. Burden of methicillin-resistant staphylococcus aureus infection at a Swiss University hospital: excess length of stay and costs. J Hosp Infect 2013;84:132-7. 18. Cosgrove SE, Sakoulas G, Perencevich EN, Schwaber MJ, Karchmer AW, Carmeli Y. Comparison of mortality associated with methicillin-resistant and methicillin-susceptible staphylococcus aureus bacteremia: a meta-analysis. Clin Infect Dis 2003;36:53-9. 19. Dodds Ashley ES, Carroll DN, Engemann JJ, Harris AD, Fowler VG Jr, Sexton DJ, Kaye KS. Risk factors for postoperative mediastinitis due to methicillin-resistant staphylococcus aureus. Clin Infect Dis 2004;38:1555-60. 20. Hübner NO, Siebert J, Kramer A. Octenidine dihydrochloride, a modern antiseptic for skin, mucous membranes and wounds. Skin Pharmacol Physiol 2010;23:244-58. 21. Stahl J, Braun M, Siebert J, Kietzmann M. The	effect	of	a	combination	of	0.1% octenidine	dihydrochloride	and	2%	2-pheoxyethanol	(octenisept)	on	wound	healing	in	pigs	in	vivo	and	its	in	vitro	percutaneous	permeation	through	intact	and	barrier	disrupted	porcine	skin. Int Wound J 2010;7:62-9. 22. Harbs N, Siebert J. In vitro efficacy of octenidine and polihexanide against biofilms composed of pseudomonas aeruginosa. GMS Krankenhaushyg Interdiszip 2007;2:Doc45. 23. Müller G, Kramer A. Biocompatibility index of antiseptic agents by parallel assessment of antimicrobial activity and cellular cytotoxicity. J Antimicrob Chemother 2008;61:1281-7. 24. Vogt PM. Praxis der plastischen chirurgie. Berlin: Springer; 2011. 25. Rubin JA, Whetzel TP, Stevenson TR. The posterior thigh fasciocutaneous flap: vascular anatomy and clinical application. Plast Reconstr Surg 1995;95:1228-39. 26. Kim PJ, Attinger CE, Steinberg JS, Evans KK, Lehner B, Willy C, Lavery L, Wolvos T, Orgill D, Ennis W, Lantis J, Gabriel A, Schultz G. Negative-pressure wound therapy with instillation: international consensus guidelines. Plast Reconstr Surg 2013;132:1569-79. 27. Ludolph I, Fried FW, Kneppe K, Arkudas A, Schmitz M, Horch RE. Negative pressure wound treatment with computer-controlled irrigation/instillation decreases bacterial load in contaminated wounds and facilitates wound closure. Int Wound J 2018; doi: 10.1111/iwj.12958.